My primary material is clay, Red Clay in particular. I got serious about red clay while throwing at a Pottery in Vass NC somewhere around 1980. At that time we were making a lot of large unglazed redware jardinieres, strawberry jars and such. Thick pots made fast from soft clay, not much refinement of shape there but I loved the way that clay felt running through my fingers and the earthy, almost swampy smell of it. Taking that most common of muds and learning what I can do with it is a process that began for me then and continues now. 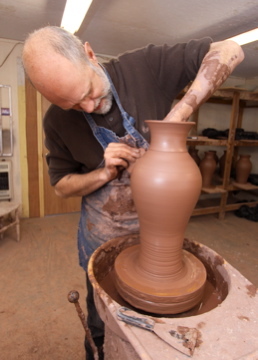 All of my work is formed on a Potter’s Wheel. Potters have all manner of tools. Sticks, wires, cutters of all kinds, almost anything can be used for something in working with clay. The Wheel however, is another matter. It is an instrument. And like a musical one it takes many, many hours of daily practice and repetition to become proficient. I first sat down at a kick wheel in a high school art class in 1972 or maybe ’71, it’s getting hard to recall. I got hooked right away and have been trying to get good at it ever since. It is very important to me that my work be accessible to people. I don’t make pots for art galleries or museums, I make them for people’s homes. My bowls and platters look best on tables with food being shared by families and friends, planters and vases with someones favorite herb or fresh flowers. Some pieces certainly are more decorative in nature. Those are an expression of my joy in the process and hopefully become a part of someones day to day life. In my thinking “Intersections” is about the intersection of form and surface. Form or shape that grows and expands from within is the essence of all my pieces. 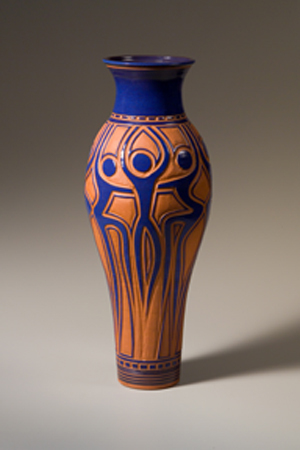 Glazes and carving are used to emphasize the shapes and bring color and texture to the surface.